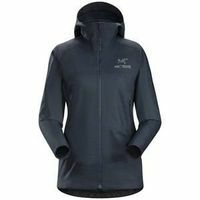 Women's lightweight, packable, wind resistant Kauss softshell hoody with air permeable, stretch side panels. Excellent for hiking and trekking in windy, cool conditions. Versatile, light and packable, the Tenquille Hoody offers essential protection while trekking or hiking in shifting conditions. Made from Arc'teryx Kauss 100% polyester softshell with a durable water repellent finish, the Tenquille resists moisture and repels wind. A light, durable double weave, Kauss has a textured backer for comfort next to the skin. Highly air permeable Circuit polyester panels under the arms aid ventilation and deliver performance stretch. The streamlined, fitted hood adds protection and warmth, and the cuffs have a knit gusset that helps create a secure seal but still allows the sleeves to be easily pushed up for heat dump. Arc'teryx designs are thoughtful, thorough and inspired by use. This includes a no-compromise approach when developing for women. With careful, detailed attention put on specific aspects of fit, freedom of movement, feature selection and performance, the Tenquille Hoody's design is driven by a focus on function, with a fit and ergonomic freedom developed specifically for women. The Arc'teryx commitment to ergonomic performance and fit is an important factor that makes a significant difference in overall performance and comfort. Freedom of movement is built in with articulated elbows and gusseted underarms. The Regular fit is streamlined but allows room for light layers, and the hip length cut rides comfortably under a hipbelt. Two large hand pockets are easily accessible while wearing a pack. Easy to pack and weighing only 255g (9oz), the Tenquille is designed to explore.